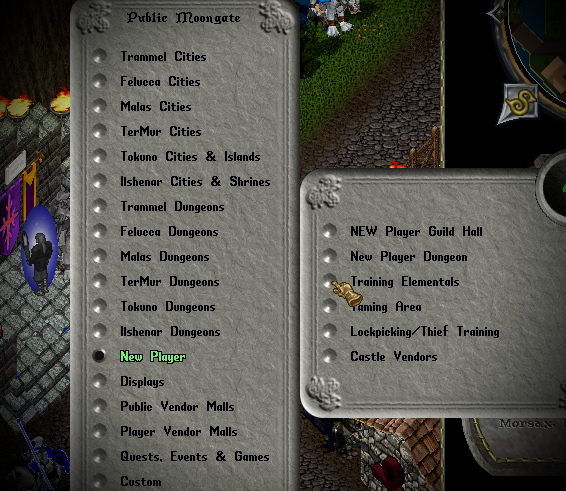 First of all let me welcome you to UOEvolution - the most expansive shard in Ultima Online community. If you are new here it is good to familiarize yourself with UO Evolution rules and peek at frequently asked questions. Here are some pointers to help you get a fresh and easy start on this shard. You should pick a catchy name. RPG names are better than just something plain like monkeyface. On the character creation screen there are a few races to choose from. You get a bonus by having 20 minumum level in all skills when starting out. It does nt show up in skill menu but you hit more often with with 0% in swordsmanship than any other race. You can also start gaining parry at 0% on the elementals. Other races have to buy it up first. 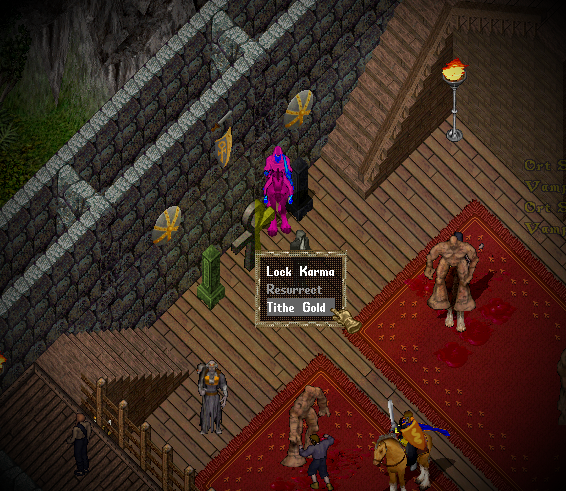 Elves gain an increased chance to passively detect hidden monsters and enemies. They themselves are harder to detect too. +5 to Energy Resistance cap. All resistance are capped at 70 but elves can have energy resistance at 75. -Gargoyles - not really supported on this shard right now. When you spawn into the game you will see a lot around you. 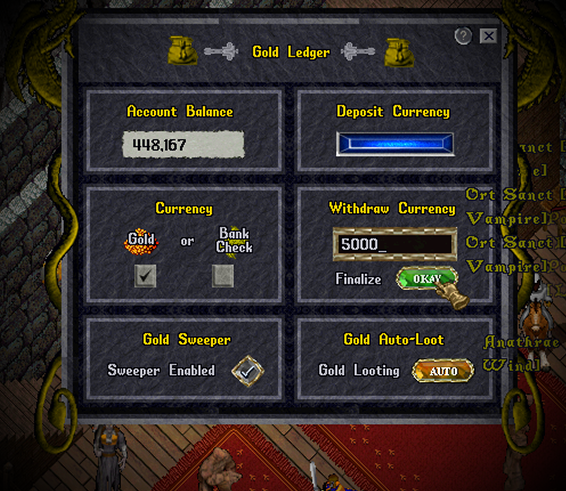 You start with gold and token ledger, together with some gold, a loot bag and trash bag. You also notice a skillball that you can use to raise your skills. Do not use it until you read point number five. First thing you might want to do is to work on your skills. Step into the moongate and go to Luna in Malas. Buy a Book of Chivalry from the Keeper of Chivalry there. If he is hidden behind a building you can press ctrl + shift and then click on his name to get the menu. Chivalry spell "Sacred Jorney" is a good spell to use if you want to recall from your runebook, runes or books from Domino's rune library, located under customs when stepping into moongate. After you get the book you can get some training done. Again go to the moongate but this time go to the Training Elemental room. In this room you can max your combat skills using the weapos on the tables. There are weapons with regenerations. You can also use spirit speak to heal yourself and it can be macroed while you are fighting. There are npc-s standing near who can train you. They also give you skill training quests with various rewards. New Haven in Trammel also has various NPC-s who can train your skills up to 40. 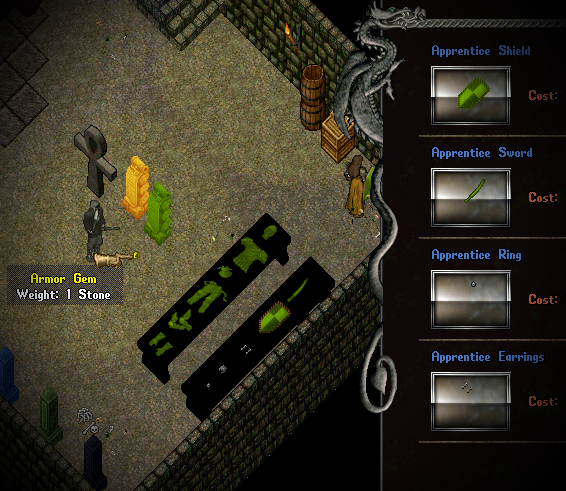 In the Training Elemental room you will find an ankh. Tithe gold there by taking some out of your ledger. Gold is required to cast chivalry spells. 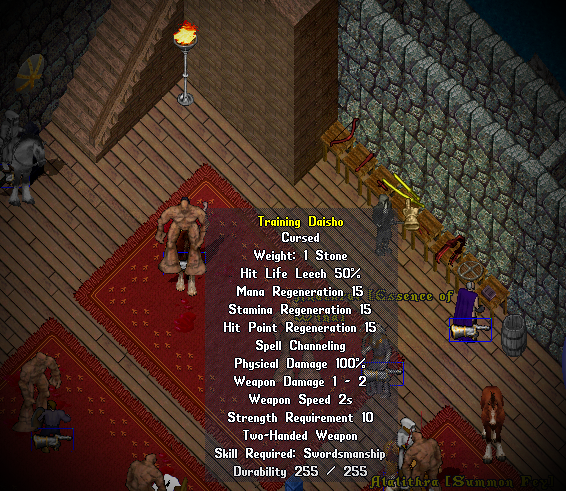 As you train up your combat skills you can practice some combat in New Player Dungeon. You can kill green hued monsters there who drop green gems. You can trade those in at the entrance for lrc armor. At 100% lower reagent cost you can train up your magic skills without the need to have reagents or coins for chivalry. You can also then train up your magery and necromancy with your lower reagent suit. As for archery, you do not need arrows or bolts. When you are fighting your stats will also rise. they can raise by 1 point every 15 minutes. Here you can have up to 300 total stats or up to 350 when using stat scrolls. Strength can go up to 150, dexterity up to 165 and intelligence up to 150. Stat gain even if you have maxed your skills. use the following command to speak with others in global chat. You can also send private messages. it is not advised to use your skillball right away. You can work all fighting skills in the Elemental room. After having the apprentice set with lower reagent cost from Beginner Dungeon you can work your casting skills up without regs. There is a lot of ways to gain skills, you can buy brush from animal trainer to make dyes for example. An easy was to gain taming. Regarding skills every skill has some use. There is an uniue system regarding parry and bushido in UOEvolution. When using a shield your parry skill is checked. When fighting unarmed or using a bow you get no defence. When using only 1 handed or 2 handed Weapons your bushido skill is checked. In the new system every attacker and defender has a Base Attack Score and a Base Defense Score. Bushido: BDS = (Bushido)(Weapon Type)% + (Tactics)% + (Focus)% Skill no longer determines if you are using parry or bushido, what does is how you are equipped. There are many tactics you can use to start making gold. Other way to earn your living is through fighting. Go hunting with a good weapon. You can buy Zelda sword or do the quest for it. Use necromancy spell vampiric embrace to get life leech based on your damage. You can also work your taming up. Buy it up from a trainer and work it with brushes or use skill ball. Taming a drake or dragon can greatly assist you in fighting. You can also buy 105 taming/lore power scrolls from players and get a cu-sidhe, it can also heal itself and the owner which makes it a good hunting partner. Loot Bag is a valuable tool in your bag. First command grabs everything that is in the corpse you are looting. 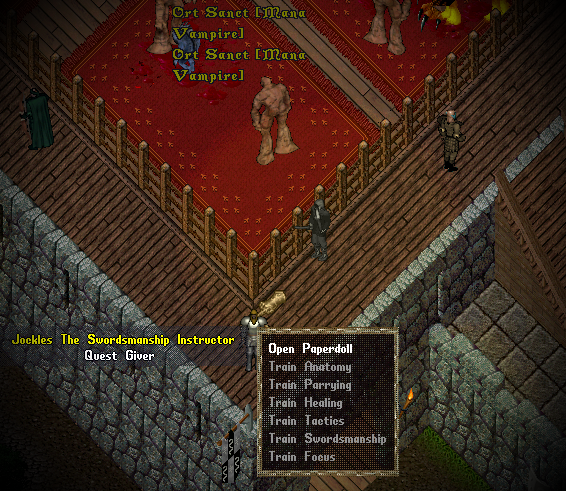 The second command automatically cuts the corpse aswell and loots the items that are in your loot list. 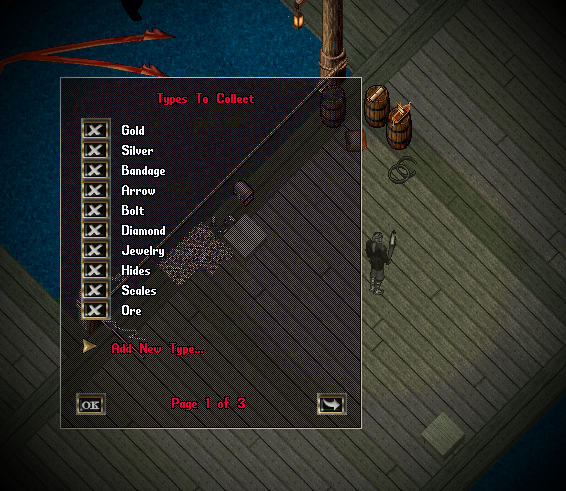 It is sometimes bad to use if you loot gems and reagents as sometimes when you are near overweight items dont stack and your bad will become stuffed. For looting its good to use UOSteam autolooter. it stacks everything ant it is automatic. 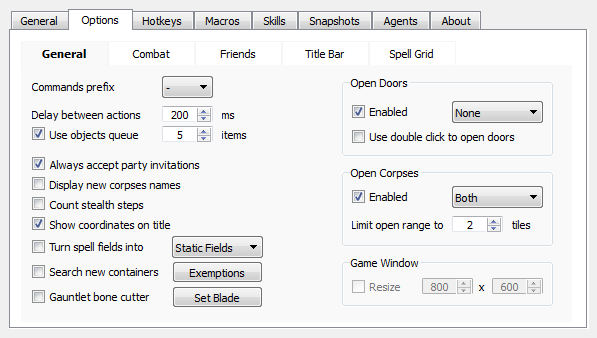 Also check the open corpses tickbox. To not lose your pet it is good to bond them. Feed your pet and stable them, then wait for a week, take them out of the stable and feed them again. If you dont want to wait the wole week to bond your pet in the stable you can buy bonding deed with tokens near Britain bank. Always when buying a pet from a player you need to bond them. Be sure to insue your items. 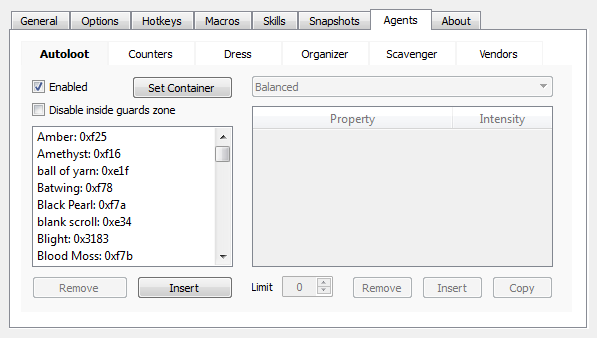 Click on yourself once and you will see an option Toggle Item Insurance. Click that and you can insure items that you target. To toggle renewal so that it auto isures when you die, click on Auto Renew Inventory Insurance. You can resurrect yourself near the Ankh or a healer who wander the lands of Ultima. You can also use help menu to resurrect yourself, but only every 30 minutes. Always remember to insure your items and also toggle auto renewal of item insurance. Click on yourself and select them from the menu. Always have gold in your ledger and keep it in your pack or your items will not insure after you die. Gold ledger doesn't have to be in your main backpack. 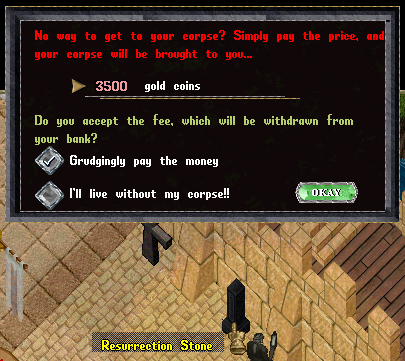 You can use the resurrection stone to get back your corpse if the place is far away or dangerous. You can use the pet resurrection stone to get your pet back to life but only if your pet has a ghose, meaning it had to be bonded. You can get your pet by using [getpet if it got lost. For new players it is strongly suggested to join the NEW guild. Ask for them in global chat to join up. They will help new players get to know UOEvolution content and also graduate you after 45 days. You will learn about his shard and make new friends along the way. You can also take a look at Sagemoon's and Belgaron's beginner guides. Enjoy your stay in Evolution shard!